River & Canal Boating in France. Quite by accident several years ago we stumbled onto an alternative kind of holiday. A little tired of just getting a drivers tan each summer from road trips I craved something different but similar. Given a choice we tend to avoid airports. Cattle herding queues, baggage allowances, hours waiting for planes etc does not equal fun in our book. Happy to travel just about anywhere so long as we are in control of the journey and I am able to literally pack the kitchen sink, our go to adventure has always been by road. One where we can stop anytime and explore at our leisure. Having tried a summer break on the British canals we found that the experience in principle was enjoyable but dampened (quite literally) by the weather. We found ourselves stranded on the River Avon when it flooded 2 meters higher than is should have been! But that’s another story. 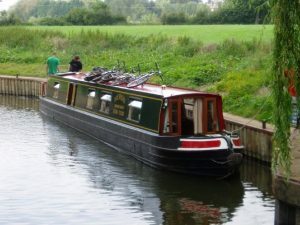 The boats, like the canals in the UK, are normally quite narrow and basic. The locks are frankly exhausting and the scenery whilst pretty is a bit too close to home to feel like a real “holiday”. The adventure got us thinking. Could we take all the good things about boating and remove all the bad things? Magnify the solitude, scenery, good food and improve the weather? Turns out YOU CAN! Mainland Europe has a totally different approach to canal boating. Simply put, everything is bigger and in our humble opinion better. The boats are more powerful, easier to drive and more luxurious. The locks are mostly automatic and sometimes even come with a lock keeper to get you through safely. The scenery is great -assuming you like rolling vineyards and sunflower fields. The weather is typically warm and fairly sun sure the further south you journey. The food, the little villages, the locals, the wildlife…I could go on! In typical Muffin style, enter internet searches and endless hours trawling for websites/ companies that could give us what we are looking for. In France it’s possible to hire a boat without a licence which is great because we don’t have one! The providers give you full tuition when you collect the boat. There are 4 main companies in France to choose from; Le Boat, Locaboat, Nichols and Les Canalous. These guys offer boating holidays across the world from Canada to Ireland. After several years, we have now traveled with all but Nicols (who never seem to be able to budge on their costs) a number of times. So, what advise can I share with you based on our experience? As normal its all about cost for me. I am a professional buyer after all! These types of breaks are not normally cheap and can set you back many thousands of pounds. I can honestly say the buyer in me wont settle for anything less than a deal. We have never paid the going rate and we shop around every time. Buy as late as possible. 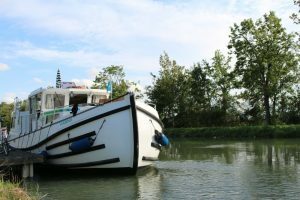 We have in the past successfully booked a boat while on the ferry over to France and collected the following day saving 60%+ off the normal rental price. The boats are fixed costs for the company so its better for them to have them rented than sitting there gathering dust. The days of last-minute bargains are not over in this industry. Location if you are not picky where you end up you can also save a big chunk of money. I always ask when booking where the company has boats still to sell and then weigh up the options. Transfers – the companies charge more for 1-way cruises. Tourists tend to like to only see their scenery once. As a consequence, the boats can often end up “stranded” in the wrong location for the next customer. The companies must then spend time and money moving the boats. We take advantage of that and do it for them for a hugely discounted price. Note you will then likely need to get back to your own transport but the cost of a taxi back to your start point is normally less than €150. Don’t buy the cleaning option – its normally hugely overpriced and the boats are small enough it does not take long to give everything a quick clean. Save yourself €100+. Do ask for the early collection/ late return options. They normally cost around €70 each and can result in in a whole extra day of boating plus you avoid the peak collection/ return times and the other pesky tourists! Do ask about the all-inclusive options for damage and fuel – they can save you some big bucks but do the math and don’t take their word for it. Enjoy and do let us know if you have any other handy tips for our readers. Comment below.